Obituary for Mildred Joyce (Ginter) Stupak | Swan Valley Funeral Services Ltd. It is with great sadness that the family of Mildred Joyce Ginter Stupak announces her sudden passing at the Swan River Valley Lodge at the age of 74 years. Born in Swan River, August 1, 1944 to Bernhart and Mary Ginter (Rosentreter), Mildred spent her childhood, was educated, married and raised her family of five children in the Valley. Mildred faithfully attended church with her family and received Jesus as her personal Lord and Saviour at an early age. She was baptized at age fifteen. In 1962 she married Tony Stupak, and together they farmed in the Lancaster District northwest of Swan River until their retirement, remaining on the farm until Tony’s death when Mildred moved into Swan River. Mildred missed Tony immeasurably and so decided to visit with her sister Elaine Ritsema in Edmonton. 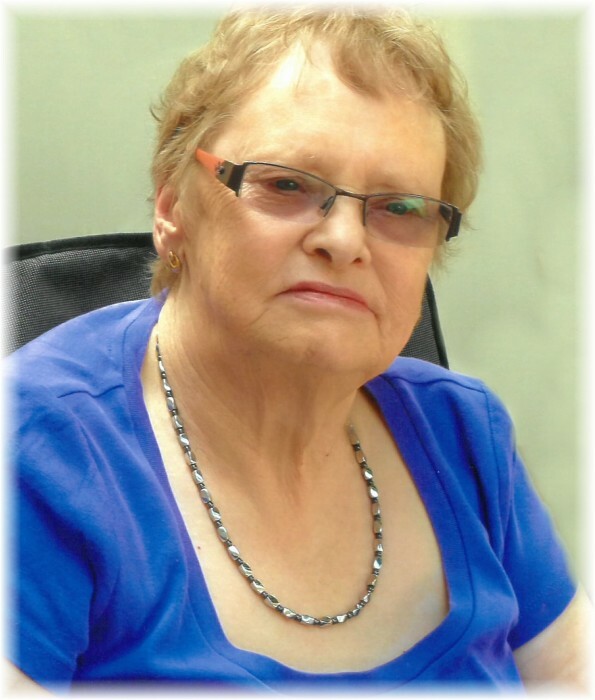 Health issues arose and due to many difficult complications, Mildred stayed in Edmonton for ten years (2005-2015). Mildred longed to be closer to family, so the decision to move back to Kamsack was made in 2016, where daughter Eunice was nursing at the time. After Eunice’s death, application was made to have Mildred return to Swan River, where she would be closer to son Michael and friends. She resided there one month. Mildred was always very active on the farm and enjoyed gardening, cooking, baking, sewing, crafts and puzzling. Although she attended First Baptist with her family, she would often attend other churches if there were special music groups visiting. Her favourite songs were hymns, but she enjoyed country and contemporary music also. Probably her greatest enjoyment was reading; she loved reading her Bible and the Daily Bread. In later years, she developed a love of writing and would always carry her “book” with her, never forgetting a thing, because she would write it down. She also loved to send cards and letters to everyone for birthdays, holidays, or sometimes for no special reason at all. Mildred loved a good cup of coffee with her neighbours. Going to town with Tony was a real highlight for her, as she loved to shop, look around to see what was new and to meet neighbours and friends. Although Mildred's health issues caused her to slow down, she still enjoyed visiting with family and friends. Her family meant the world to her. Her favourite saying was “Family is Forever”. Mildred will be lovingly remembered by her children, Bonnie (Kenn) Matwick, Nanaimo, British Columbia; James (Stephenie), Saskatoon Saskatchewan; Kevin, Morningside, Alberta; and Michael, Minitonas, Manitoba; grandchildren, Jesse (Kasie) Lough, Nanaimo; Shelby (Tyson) Sawatzky, Saskatoon; Caitlyn Stupak, Lamoni, Iowa; Jaymee Stupak, Saskatoon; Becki Keehn (Josh Elias), The Pas, Manitoba; Joseph Gustafson (Caitlyn Goodman), Langenburg, Saskatchewan; Faith and Alexa Stupak, Minitonas; and all of her extended family. She was predeceased by her husband Tony in September 2001; her daughter Eunice in June 2017; and her parents, Bernhart in April 1956 and Mary in August 2018. We would like to especially thank all the caregivers who added to the quality of her life. An evening visitation was held Friday, April 5, 2019 at 7:30 p.m. from the Chapel of Swan Valley Funeral Services, and a celebration service at 1:00 p.m. Saturday April 6, 2019 with Pastor Bob Lewis officiating. Interment for family took place in the Birchwood Cemetery immediately following the service. If friends so desire, donations in Mildred’s memory may be made to the Gideons International in Canada or Our Daily Bread https://ourdailybread.ca/ .